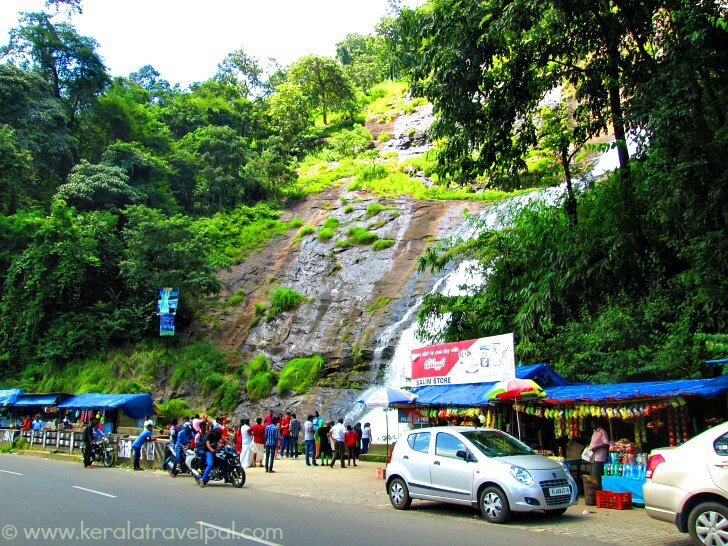 Cheeyappara waterfall (also Cheeyapara) is one of the road side attractions that will captivate you while travelling along Cochin – Munnar highway. This cascade is created by River Deviyar as its plummets down a huge rock. Water jumps down from one rocky slab to the next thus creating several layers. Being so close to the road means it is easy to stop by and enjoy. On the other hand, enjoyment is limited because of such a location right on a major highway. Space is not much, so forget about finding a private spot and spreading picnic mats. That means spending several hours is out of question. It is risky to get into the waterfall past the protective fence. So splashing in water at the fall is not possible. After creating a small bottom pool, water flows down the road to continue its journey as a jungle stream. There are a few make shift stalls on either side of the waterfall. They sell small souvenirs, snacks and soft drinks. Great to sip a coconut drink and relax because the scenery around is awesome. On a sunny day, you may feel to do just that. Check before going there on heavy rains. A few years ago, huge landslides happened right next to Cheeyapra waterfall. Several people were killed as vehicles got buried in mud. Restoration of ghat highway in those areas was still going on when I visited there in September 2014. 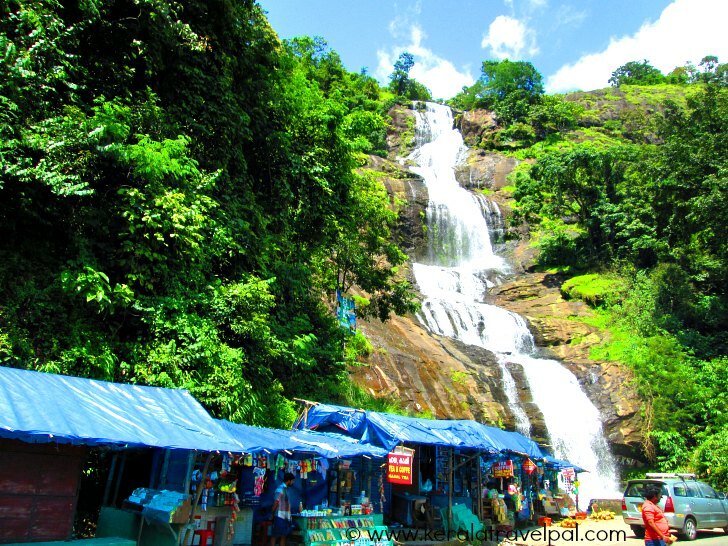 Cheeyappara is often mentioned along with Valara waterfall, which is about 12 kms away. There more waterfalls and streams within the forest. There is trekking potential however the area is yet to be developed as a trekking destination. Neriamangalam and Adimali are two towns on Cochin – Munnar route. Cheeyapara is about 12 kms from Neriyamangalam. Adimali town is about 18 kms from the cascade. Nearest towns : Neriyamangalam at 12 kms, Adimali at 18 kms, Munnar at 45 kms and Cochin at 85 kms. Bus Station : Neriyamangalam at 12 Kms. Taxi Hire : Neriyamangalam at 12 Kms. Railway Station: Eranakulam Railway Station at 84 km, Aluva Railway Station at 64 Kms. Air port: Cochin Int’l Airport (COK) at 62 Kms. Accommodation Options: Adimali, a town in the middle of hills, have some hotels. More choice at Cochin and Munnar. Best time to visit: Throughout the year. This is a perennial fall. Nearby Attractions: Valara waterfall, Chinnar Wildlide Sanctuary, Marayoor, Manavan Shola, Periyar Tiger Reserve, Kumali, Munnar, Devikulam, Peerumedu, Eravikulam National Park, Mattuppetty, Arch dam, Idukki wildlife sanctuary, Anamudi, Eco Point, Top Station, Thommankuthu, Keezharkuthu, Attukal, Chellarkovil, Carmalagiri elephant walk, Anachal, Malankara reservoir, Mangala Devi Temple, Meenuli, Kundala dam and Kalvari Mount.